Actuate, now OpenText - provides embedded analytics solutions spanning enterprise scale data-driven applications, big data analytics and customer communications. More than 3.5 million BIRT developers and 200 million customers use Actuate’s embedded analytics solutions to build scalable, secure applications that save time and improve brand experience. OpenText is the leader in Enterprise Information Management (EIM) software to companies across all industries to leverage their business information on-premises, in data centers or in the cloud. More than 100,000 companies use OpenText solutions to unleash the power of their information. 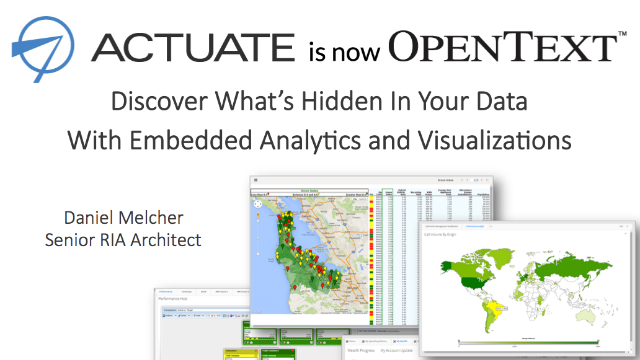 For more information, please visit: www.actuate.com and www.opentext.com. While everyone knows the potential value of the data coming from social apps, machine logs, mobile devices and cloud platforms, putting it in the right context allows you to discover what you may be missing and allows you to deliver truly valuable analytics. In this webinar, we will outline the latest thinking around delivering meaningful data visualizations including best practices and real world examples. You will get a glimpse of how your peers are using unique data objects, rich visualizations, granular security and more as a competitive advantage with embedded analytics. This webcast sets the stage for the next wave of big data management and the Four Pillars of Business Analytics. During this webcast you’ll see how Data, People, Process, and Technology drive analytics as an ongoing business discipline. Gartner indicates by 2015, 25% of analytics capabilities will be embedded in business applications. Designing data visualizations for web and mobile apps have become a major growth engine for the worldwide Business Intelligence and Analytics Software Market. Transforming analytic data into valuable business information, and designing compelling data-driven experiences for customer-facing apps remains an art and a science. Fortunately, an emerging set of design principles inspired by the four pillars provides a blueprint for delivering apps that inform, connect, and motivate end-users. Join us and learn how to use the four pillar ecosystem to seamlessly embed analytics. Big Data is all the rage right now, with IoT devices, social apps, machine logs, and noSQL cloud platforms gathering valuable data in increasingly high volumes every day, it’s understandable why the topic is hot. But big data is arguably worth nothing if you can’t harness and make sense of it all. Uncovering meaning hidden within big data is a cornerstone of NextGen BI, and there is no better way to do it than with effective visualization. This session will examine different visualization techniques based on specific big data use cases, and will explain how each technique brings meaning to the data, providing a deeper and more contextual understanding of the information for the user. Today's organizations need to display data in interesting, meaningful ways in order to take action and make the right business decisions. Often, difficulties arise when choosing the correct visualization to best highlight the important message the data provides. Attend this web seminar to learn ten tips to create spectacular data visualizations using BIRT that will provide actionable insights and delight your users.